Whenever we travel to Italy, we always make sure to spend some time in small, characteristic villages. It frees the mind from the noisy and fast paced atmosphere of the large cities, and it shows us the simple and traditional side of Italy and the Italians. Tredozio, in the heart of the lush Emilia-Romagna region, is just such a place. You hardly ever hear it mentioned as a vacation destination, and because of this, it’s less likely you will run into tourists here. Just people who want to enjoy a beautiful countryside setting with breath-stopping views, charming properties and delightful people. After a tasty breakfast at Torre Fantini (pictured above), we take to the road for a morning of site visits. First stop is Casa Eleonora, which occupies a high position on the mountainside that looks down into the valley that includes Tredozio. It’s nearly a 360 degree position, with a pool set right at point of the most expansive view. The valley includes rolling hills and neighboring farms and villas. Casa Eleonora has a main villa with two floors (which can be rented separately), and a close-by chapel that has been renovated. Altogether, the estate can sleep up to 16 guests. 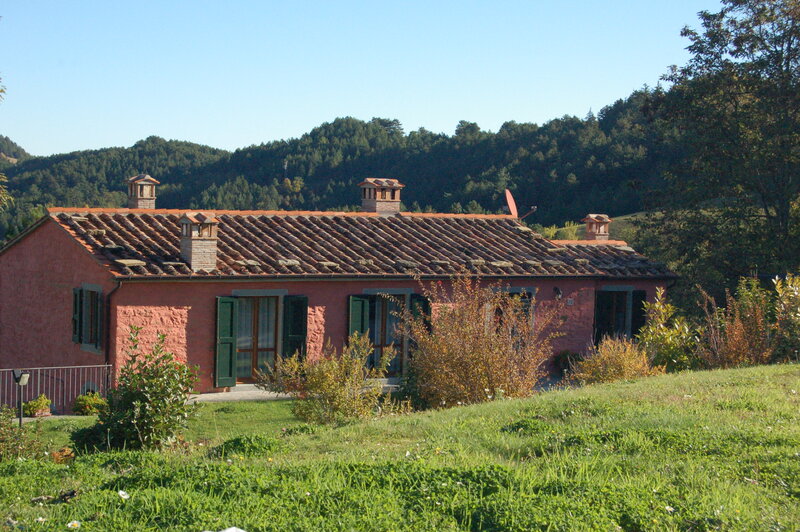 Not far away, a little higher up the mountain, is Casa Caterina, a perfect spot for three couples or a family of six. The owner also owned a crafts shop, and so the house is filled with clever tile decorations, graphic design pieces, cups, plates…you name it. As with all the other properties we offer in this area, Casa Caterina enjoys a broad and unspoiled view of the countryside. As we go from one villa to the next, we cross and re-cross the border line that divides Tuscany from Emilia-Romagna. Mussolini, who came from this region, reclaimed this part of Italy from Tuscany and made it a part of Emilia-Romagna. Our final destination, Casa Alta, also occupies a heavenly perch above the countryside. It has two levels, which can be rented separately or as one villa which can accommodate up to 16 guests. Here, you can lounge around a beautiful pool with equipped outdoor area and enjoy majestic vistas. On the inside, the villa has recently been updated with well equipped kitchens, comfortable furniture and satellite TV. All four of these wonderful properties are perfect for a tranquil visit to the unique country setting of Emilia-Romagna. After a nice lunch in a family-run Tredozio restaurant, we say goodbye and set our sights for Umbria. This entry was posted in 30 Days on the Road in Italy, Emilia-Romagna, Italy up close and tagged accommodations, casa alta, caterina, eleonora, emilia romagna, Italy, torre fantini, travel, tredozio, villas. Bookmark the permalink.